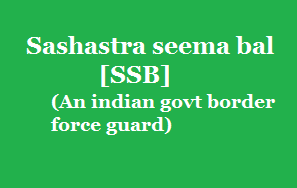 Sashastra seema bal (SSB) is governed under the control of Ministry of Home Affairs (MHA), Govt . of India. SSB is an important border force which act as guard for the indian nation. Sashastra seema bal controls two borders where one of the border name is Indo­Nepal Border and another border name is Indo­Bhutan Border. SSB headquarters was at new delhi. And there are 3 frontier headquarters Lucknow, Patna and Guwahati. Inside a Frontier has many sectors in it. Inside a sectors it has few battalions. Why Sashastra seema bal was started and why it is needed very much? After indo-china war (1962) the government of india realized that country needs special committed people to protect the borders.So in the year 1963 , Special Service Bureau was created with the aim of achieving Total security preparedness.Initially started with North Assam and hill-districts some states and later extended to more states.Now SSB covering 15 states which covers nearly 10,000 kilometers.It has volunteers in the range of 2 to 3 lakhs. Recruitment for the posts of SIs/GD(DE) and Constables(GD). Const (Cobbler) & Const (Gardener).